The warning was lowered 12 hours later as visibility improved and it was clear that no volcanic ash was detected. REYKJAVIK, Iceland — Lava fountains danced along a lengthy volcanic fissure near Iceland’s subglacial Bardarbunga volcano Sunday, prompting authorities to raise the aviation warning code to the highest level and close the surrounding airspace. 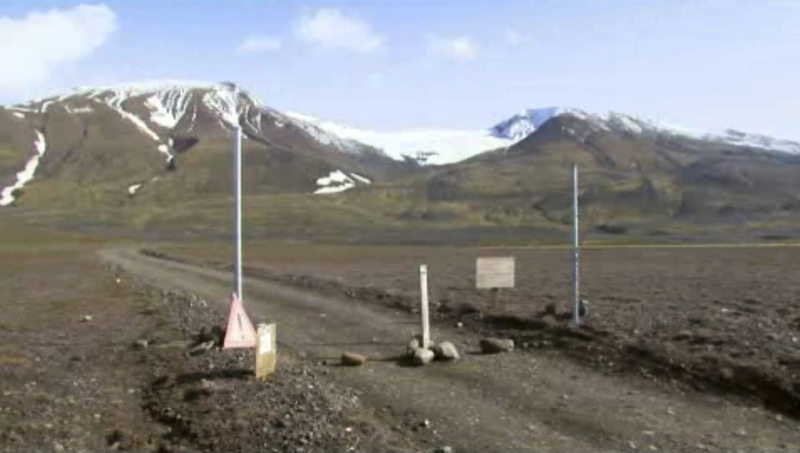 The red warning code – the highest in the country’s alert system – was raised early Sunday after the eruption in the Holuhraun lava field, about 3 miles north of the Dyngjujoekull glacier. The warning was lowered 12 hours later as visibility improved and it was clear that no volcanic ash was detected. The country’s meteorological agency said scientists were monitoring the ongoing eruption. “Visual observation confirms it is calm, but continuous,” the weather agency said on its website. Sunday morning’s eruption followed a smaller one in the same site on Friday that also prompted authorities to briefly raise the aviation warning code to restrict flights in the area. Thousands of small earthquakes have rocked the region in recent days, leading to concerns that the main volcano may erupt. The aviation warning meant that no flights were allowed in the airspace north of the fissure eruption area, up to 6,000 feet (1.1 miles) from the ground. Aviation officials said the restrictions do not affect commercial flights, which fly much higher than that. Authorities said lava fountains of about 165 feet high erupted Sunday from the fissure, estimated to be almost a mile long. The fissure eruption appeared about 28 miles from the main Bardarbunga volcano, which lies under the vast Vatnajokull glacier that dominates the eastern corner of Iceland. Though remote and sparsely populated, the area is popular with hikers in the summer. Officials earlier evacuated all tourists in the region after intense seismic activity there. Although Sunday’s fissure eruption was more powerful than the one on Friday, experts say the situation is contained and is unlikely to result in the same level of aviation chaos as 2010. In April that year, an eruption at the Eyjafjallajokull volcano wreaked havoc on millions of travelers. More than 100,000 flights were canceled after officials closed Europe’s air space for five days out of fear that volcanic ash could damage jet engines. Dave McGarvie, a volcanologist at Britain’s Open University, said the fissure eruptions produce only very small amounts of ash – they produce mostly lava – and are highly unlikely to cause any aviation disruption. “It’s good news in the sense that it appears to be very small, very contained. It’s not spreading under the glacier – if it did you’ll get a lot of flooding,” he said. He said Icelandic authorities are mostly concerned that the main volcano under the ice cap will erupt, but there are no signs so far that this is imminent.